Were any of you out there expecting an XP-Pen Artist 22E review? Probably not! Especially since I posted earlier this year that I had gotten an XP-Pen Artist 16. So, it only seems fair to explain how I went from talking about a completely different model to writing an XP-Pen Artist 22E review. It wasn’t that I didn’t like the smaller XP-Pen display tablet, it was quite simply that my eyes are aging – sometimes it seems like faster than the rest of me. I guess this is part and parcel of doing work that has you constantly staring at a monitor and even before my art, I was a project manager who spent most of my days staring into a monitor! The more things change, the more they stay the same, eh? 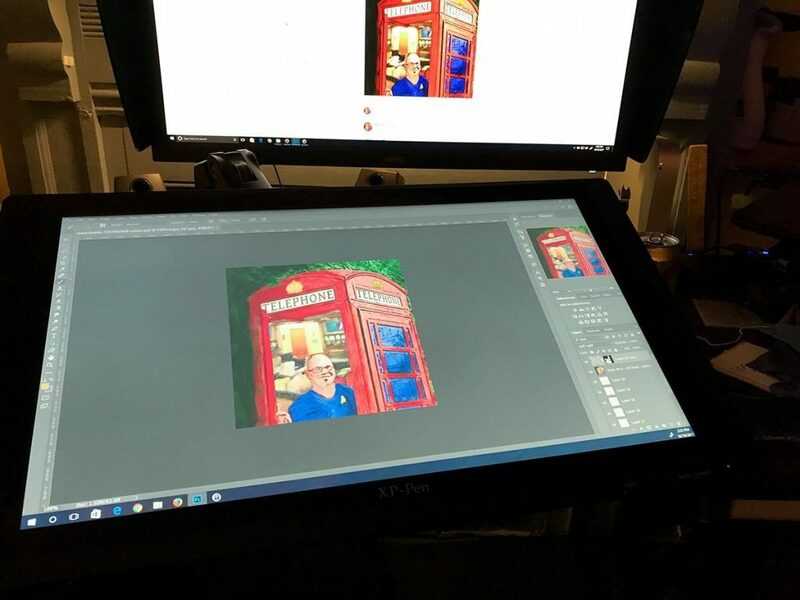 Even though the active area of my Artist 16 was larger than my old Wacom Intuos Pro, I was never looking at the Intuos, I was looking at a 27″ screen. Within about a month, I realized that I wasn’t using the Artist 16 as much as I had expected. I would often just plug in the XP-Pen tablet and use my main monitor as the display. As much as I liked the concept of the 16″, my eyes quickly got tired using it and also because of my eyes, I had a hard time finding a comfortable place on my desk to use it. It really all boiled down to size. If you have younger eyes, it may well be just the tablet for you. In fact, for now I’ve kept my Artist 16 so that I can hypothetically use it when I’m away from home. Otherwise, I liked the tablet enough I decided to go ahead and order the larger one. I felt fairly confident if I could just get closer to the size of my main monitor, it would work out. Right now, I don’t have a ton of desk space, which was one of the reasons I went with the 16″ in the first place, but I figured out a way around that problem. I’ve had my XP-Pen Artist 22E for over three months now and I am MUCH happier with it. The size is great. I wouldn’t mind a tad taller from top to bottom but this is more than workable. I don’t feel eye strain anymore which was the most important thing. As I said when I discussed my first experience with the Artist 16, it’s a night and day experience being able to work with your pen directly over your art. I have so much more control over my lines when my eyes and hands are in sync. The color on the XP-Pen Artist 22E is good. After using it for three months, I’m more in tune with the not-so-surprising fact that the color does not match that of my BenQ monitor. But the BenQ cost almost as much as the XP-Pen Artist 22E, so this really should not come as a surprise! The BenQ has a larger color range, but the Artist 22E is still a good monitor. It has an IPS screen and it’s better than some of the other IPS screens I’ve had in the past. If I didn’t have the BenQ to compare it to, I would likely rave about its colors! Instead, I get “close” with the Artist 22E and then I move whatever I’m working on to the BenQ for any final color adjustments. Everything else about the XP-Pen Artist 22E screen is satisfactory. I’ve yet to put it at an angle where the color/brightness/contrast is different which many of you can see just by adjusting the angle of your laptop screen! I wish I could rave about the screen protector that comes with it. In theory, I’d rather use one, particularly one with just a little bit of a matte finish because I get a glare from my over-head lights if I work with them on. You’ll get an idea how dark it is in here when I use it from this photo I took of it today! I lasted maybe three days with the screen protector that came with it. It doesn’t come already attached. And it’s only held on by one long strip of adhesive at the top. So You can lift it up and adjust it over and over but I could never get all the bubbles clear and the worst part was there was sort of a rainbow effect. I emailed the tech support folks at XP-Pen about it and they said they were still looking at a better option for the screen protector. Clearly I’m not the only one who has contacted them about it. Their advice was that the plastic tip of their pen was highly unlikely to scratch the hardened glass screen. Three months on, it appears they’re right. I know that I do bear down with some force and I haven’t put a mark on it. No pun intended! I don’t have any plans to try another screen protector right now. Although I welcome any recommendations from anyone else using the XP-Pen Artist 22E if you’ve found one you like! That’s my only gripe about this tablet. I’m completely happy with it otherwise. It’s made what I do easier and it didn’t kill my budget. And I know there are people out there that wouldn’t work on anything but Wacom, and if your budget allows it, awesome! I’m in a middle ground right now between thrift and needing something that will do the job. The Artist 22E is not a Wacom Cintiq, but it’s a very able tool and it’s getting the job done for me and my art is how I support myself. So yes, there are people out here making money and using Wacom Cintiq alternative tablets. That said, if I was utterly starting from scratch, new kit all the way around, I would probably be looking at the Dell Canvas right now. That’s not based on first hand experience just from the reviews I’ve seen. In my ideal from scratch-setup, I wouldn’t have so many screens. I keep my laptop screen, main screen, and the XP-Pen Artist 22E screen all on when I’m doing work on it. It’s not infrequent I lose track of which screen my cursor is on! It’s sort of my version of button, button, who’s got the button! Sometimes even if I’m using another screen, I pick up the pen just to bring the cursor to the 22E screen so I don’t have to search for it anymore. Ha! Rather than add a screen, I’d like to lose one. I’d love it if I could use one big screen both for my art and general use, i.e. put it on a bracket and place it to vertical when I just need a screen and then pull it down when I want to paint or draw. The Dell Canvas or an actual Cintiq if I won the lottery or business went through the roof for awhile would be nice to have as that single screen. I know some people love multiple monitors. Two is alright. Three is too much for me! Don’t take that as a knock on the XP-Pen Artist 22E, though. For many of us out here, it’s a Cintiq alternative that balances performance and price. It lacks some features like brush tilt and rotation and the wider color space in the display but I didn’t personally use tilt or rotation on my Intuos Pro, and although the color is better than many screens out there, it doesn’t beat my BenQ so I will always defer to it for my final color work. If you’re expecting a Wacom for under $700, keep saving your pennies! I want to be realistic about that. You’re not getting an un-branded Wacom Cintiq. I think the closest thing to a “basics” brand Cintiq is the Dell Canvas and it’s still more than the two tablets I bought this year put together – never mind just one of them! And the Dell Canvas doesn’t come with a full-on stand nor a VESA mount! So for me anyway, the XP-Pen Artist 22E fits a much-needed niche. It isn’t flashy but it does the job I need it to do. It’s definitely a step-up from my old Wacom Intuos. If that sounds like what you’re looking for too, I suggest giving it a try! If you found this XP-Pen Artist 22E review helpful, I hope you’ll consider shopping on Amazon with one of the affiliate links above. I’ll get a small commission for any purchases you might make but you will pay the same amount as you would by just going directly to Amazon and searching for the products in question! Also, if you have any questions after reading this review, please ask them! You can get rid of the rainbow effect by using a dryer sheet and wiping away the static. Works like a charm. Actually I tried that trick and it sort of worked. It got rid of the rainbow for about a day and a half give or take. That was the point where I finally gave up and removed it altogether. I found that tip on Youtube and the commenters there had the same experience that it didn’t last long. I wouldn’t be surprised if this is one of those things that varies with your climate. Maybe if the humidity or something is just right the dryer sheet hack lasts longer? Is it good to use without the screen protector..working directly on the screen..won’t it make marks on it? What the folks at XP-Pen support told me is that the pen tip is plastic and the screen is hardened glass, so theoretically it’s not going to scratch. I bear down on my pen. My old Wacom touch tablet looked like a wild animal scratched it to bits after three years. In less time than that, it had softer but obvious places where I had dulled the finish from constant use. So I am not an artist who has a light touch most of the time. I can only speak for my own experience. I’ve used it for half a year without the screen protector that came with it and I haven’t put so much as a mark on it. If you’d rather have a protector you could grin and bear the one that came with it or look around at places like photodon.com and get a custom protector. You’d still be a far cry from the price of a Wacom display tablet even if you got a custom screen protector. For me, I’m happy as it is, but I know some not only want the protection but also want a little more bite when they draw on the screen. A custom screen protector would be one way to get that. I had a Ugee 2150 for some time, which is the generation where all tablets of this size (Ugee, Huion, Xp-Pen etc) were looking like a rebrand of one and the same model. After some time I jumped on the opportunity for buying a used Wacom 24HD. The monitor of that one is really nothing to write home about, in fact the Ugee screen was better, sharper, more vibrant by far. Why then change to the 24HD? One thing: Pen calibration – it was awful. It was always off, however I re-tried, I even set up a fresh system, got the last driver etc. – in the end I had to click on a point 1-2cm above the calibration marks to get the cursor to be close to the pen tip, and still it was only marginally correct in the center of the screen. So, I am interested in giving Cintiq-alternatives another try, but already read 1-2 comments (it wasn’t mentioned in actual reviews) that people had a similar problem with current tablets, they had to fudge the calibration process to get “ok” results. (I am not talking about parallax of course. That is a thing the 24HD does have as well and I barely do notice it anymore. ) What is your opinion about that regarding the Xp-Pen? Does pen-calibration yield correct, reliable and repeatable results? Rob – I’m not sure what to offer in response to this. 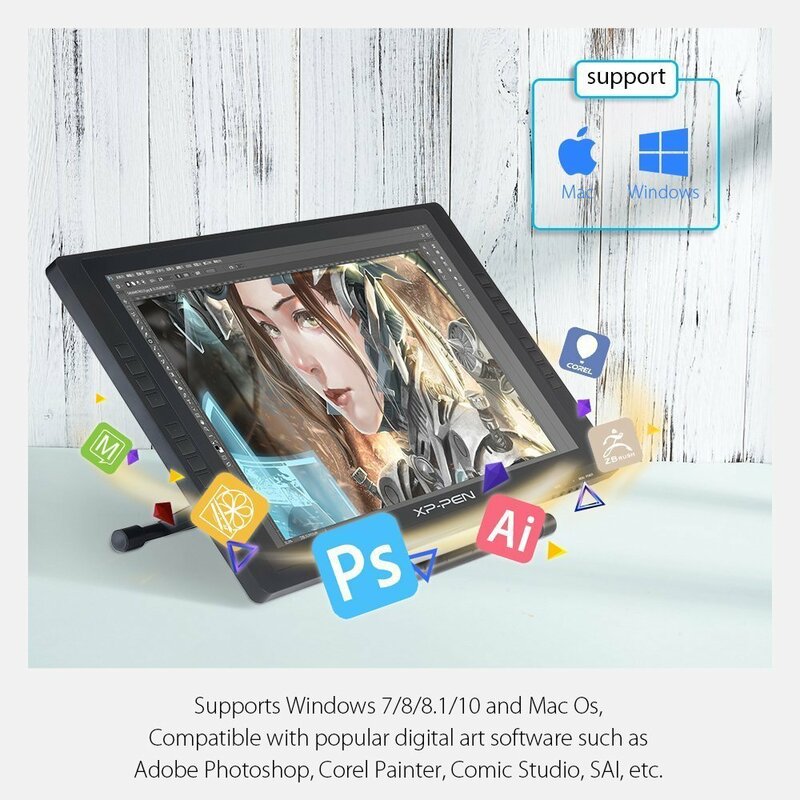 I have not tried Ugee but I have a suspicion from what I’ve watched on videos and read in other reviews, the drivers for all or most of the Cintiq alternative tablets is more or less the same. I can only offer my own experience and that’s I’ve been using this somewhere in the neighborhood of a year and so far have not had troubles with the calibration drifting off on me. For what it’s worth, I’m using Windows 10. I don’t know what roll the operating system could have had in your past problems but in a year of use the only problem I had was one time when Windows 10 updated on me and it affected the use of my XP-Pen tablet. Not a calibration issue – it literally just did not work for me. I had to roll back windows and wait for XP-Pen. When I checked with their support staff they were already in the midst of getting the new drivers ready before windows rolled out the change. I don’t remember off the top of my head, but I think the new drivers were ready within weeks. I’m a bit surprised that the screen of the Cintiq was surpassed in your experience by the Ugee you were using. I haven’t seen the Ugee, as I said, but my experience with the XP-Pen screen is that it’s as good as my IPS laptop screen but not as good as my Benq screen which has a wider color space. I’m still very happy with my XP-Pen screen. It’s a lot of bang for the buck. However, if I was starting from scratch with no screens or tablets to my name, I would at least look at the Dell Canvas. That strikes me as an option where I could use it both as my main screen and my tablet. 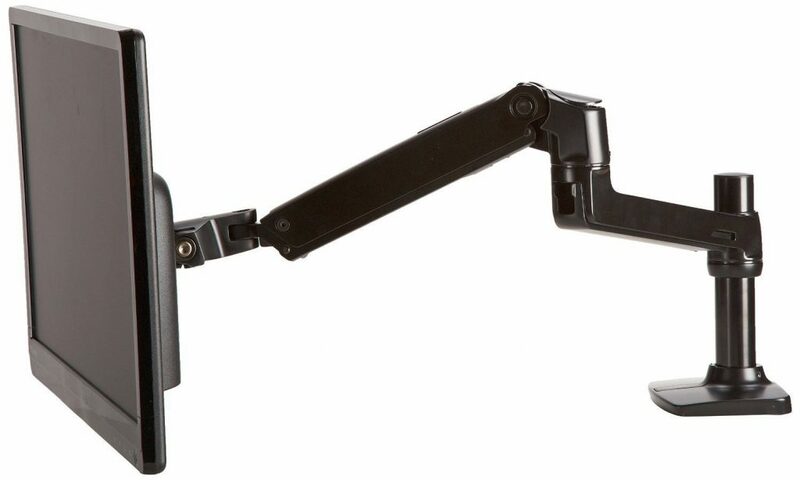 My desk space is limited and my current setup only works because I have the XP-Pen on a swing arm mount where I can rotate it out of my way when I don’t need it.